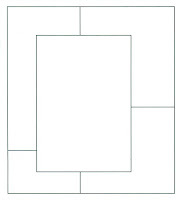 I made a similar card to this sometime ago and for some reason this sketch said it would be good to include a bookmark in the center. 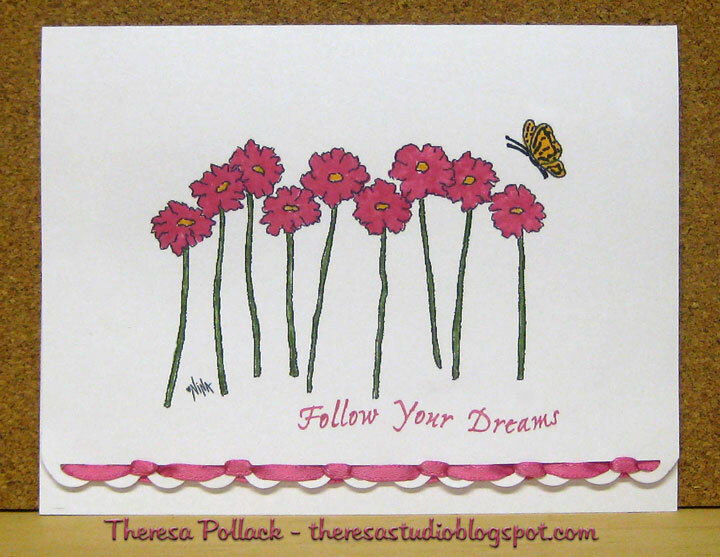 This card is for the sketch challenge at A Fairy Creative Place. 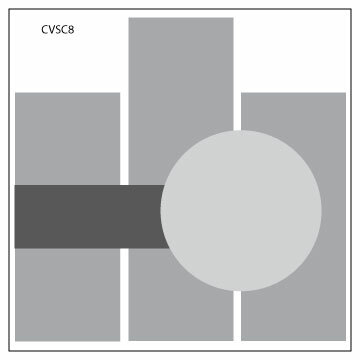 I usually try to use CCS Stamps for this challenge but these stamps seem to call out. The sketch is shown at lower left. 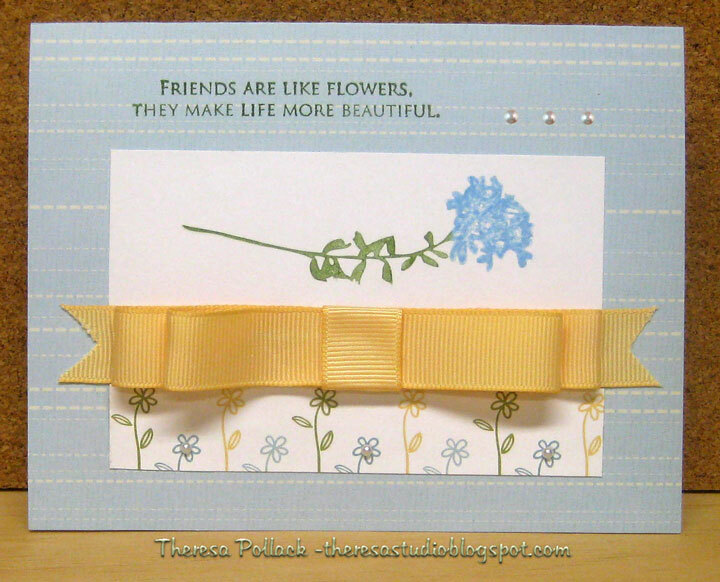 I made the card with a bookmark that I stamped with ink on confetti CS and matted on green CS and then laminated. The card was made with the same image stamped on the card underneath the bookmark so when the bookmark is removed the card is intact with a image and greeting. 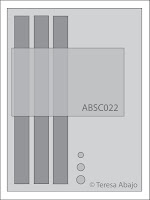 The bookmark is held in placed with brads and tabs and slips out from the card for use. 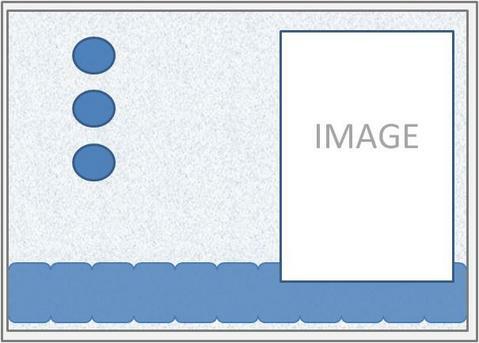 Top Photo shows card with bookmark and lower right photo shows bookmark removed. I hope you have a Happy Memorial Weekend if you are celebrating this holiday. Sassy Cheryl: use punches in your project with a Sassy Cheryl Image. Just Cute Bears: Use the sketch shown on right with a bear image. 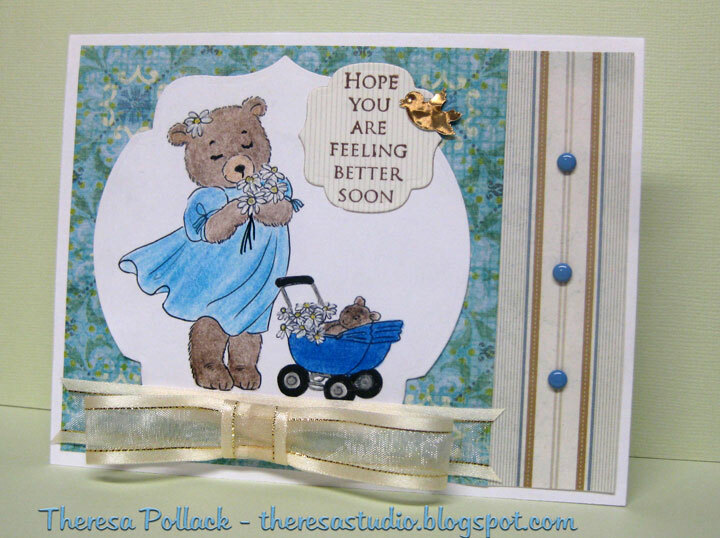 Sentimental Sunday: Get Well Creation with a sentiment. I colored the Bear Image from Sassy Cheryl free on PCP with pencils and OMS adding highlights with glitter pen. Cut the image with nesties. Attached this to a stripe mat on solid base card. 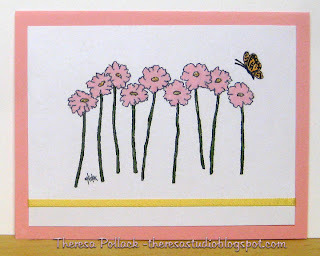 Cut 2 scallop borders with Fiskars punch that I placed beneath the stripe cardstock mat. Added ribbon with a bow and also tied the bouquet with a ribbon. 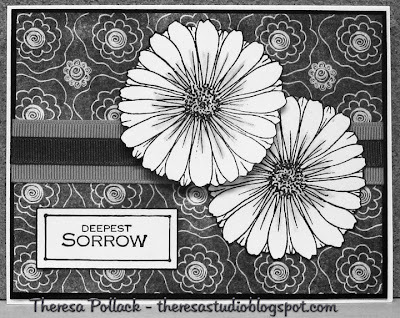 Used sentiment that I downloaded from Sentimental Sunday that was one of their weekly freebie. Hope this will cheer up someone. Thanks for taking time to drop by today. At Stamp TV, Tina challenged us to use the colors....... BURGUNDY... METALLIC GOLD... AND WHITE. I made this card using GKF 's PL Good as Gold metallic card stock, a patterned paper from K& CO with the colors of gold and burgundy and with a base card of Paper CO Burgundy. I cut out a design from the PP to feature and highlighted the design with a stardust glitter pen. Stamped the sentiment on the solid CS with versamark and embossed with gold EP. Cut out with nesties and sponged with gold ink. Sentiment is from GKD"S "Inside and Out" stamp set. Added GKD's white organdy ribbon with gold accent and a white fabric flower with burgundy pearl in center. Wish the sparkle showed up better in the photo...may have to click to enlarge to see better. A Spoonful of Sugar: Challenge this week is to make a Celebration card....they are celebrating two years of their challenge blog. Let's all find something to celebrate today! I will celebrate that you stopped for a visit! 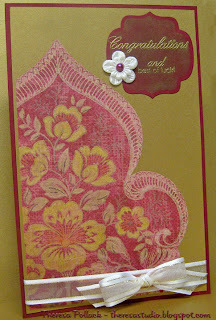 For the Stamp TV Blast from the Past Challenge, Sharri challenged us to create a project that has paper piecing on it. As I made this card I did not realize that I had used the same stamp as Sharri used in her example ...did not see that until I was posting. 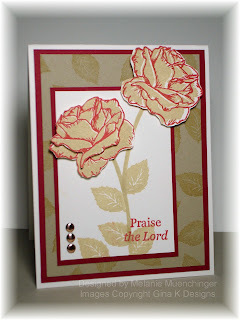 I stamped the flower twice ...once on the PP ( for the petals) and once on the solid CS (for the center). Also stamped leaves and stem on green CS. Cut out the pieces and arranged the flower on white CS matted on the solid . 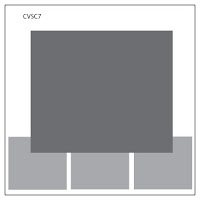 Used solid as base card and layered with mat of print. Added ribbon and buttons on each corner. 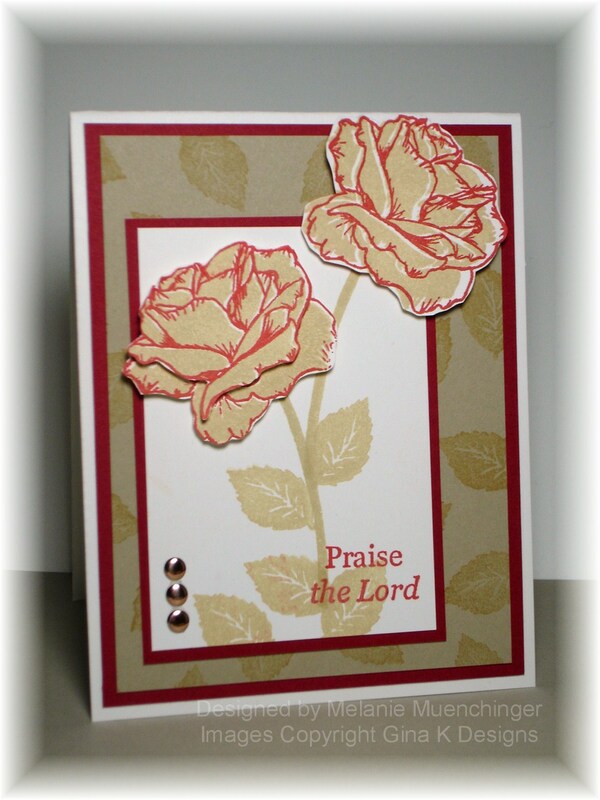 Stamps: GKD - " A Year of Flowers" by Melanie and Sentiment from "Elegant Flowers"
Have a great day! Enjoy the flowers in bloom. 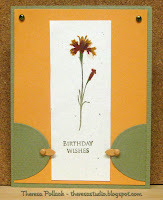 Summer brings lovely day lilies and ladybugs which inspired this project. 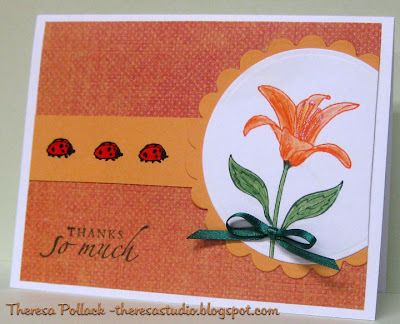 stamped a day lily and leaves, colored with pencils, and cut with a nesties circle. I matted on a scallop circle. Stamped 3 lady bugs on a strip of same paper as mat. Finished with a sentiment and a bow of green. Feels like summer today as the temperature is to go into the 90's! 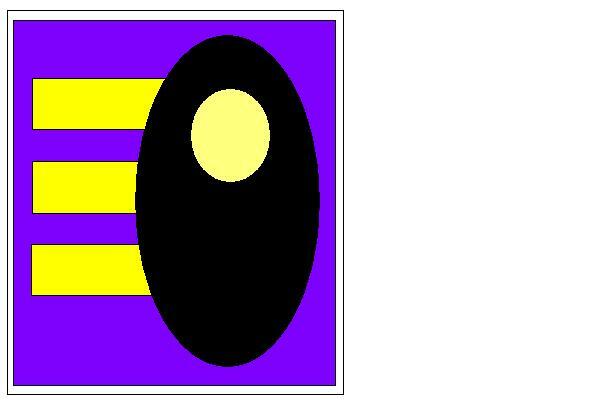 At There's Magic in the Air, my cyber friend, Patti brings us this weeks challenge. She wants us to use the "Simple Pleasures" image by Paper Cupcakes (free this week at TMITA) and do anything but a card. But our project should have a birthday theme. I found this template for a tag box that I resized to make more of a treat/gift box for my project. I forgot to mark the source on my file. I printed "Simple Pleasures" ...love that name...and colored with pencils and markers using some stickles, Sakura glaze and glitter, and Glossy Accents to add interest. Cut him out with nesties oval and sponged with die attached. Attached the image to the side of bag and added tag with ribbons to close the top. 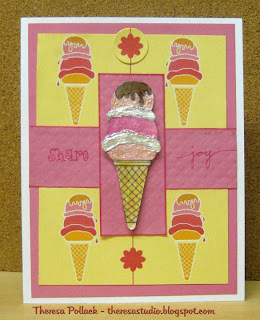 Stamp TV Inspiration Challenge 24: Make a project inspired by Ice Cream! Seems like I have been using a lot of "sweets" in my cards lately. Hope I don't gain weight with all these desserts and treats in this bag. Hope you find some simple pleasures in your life today! 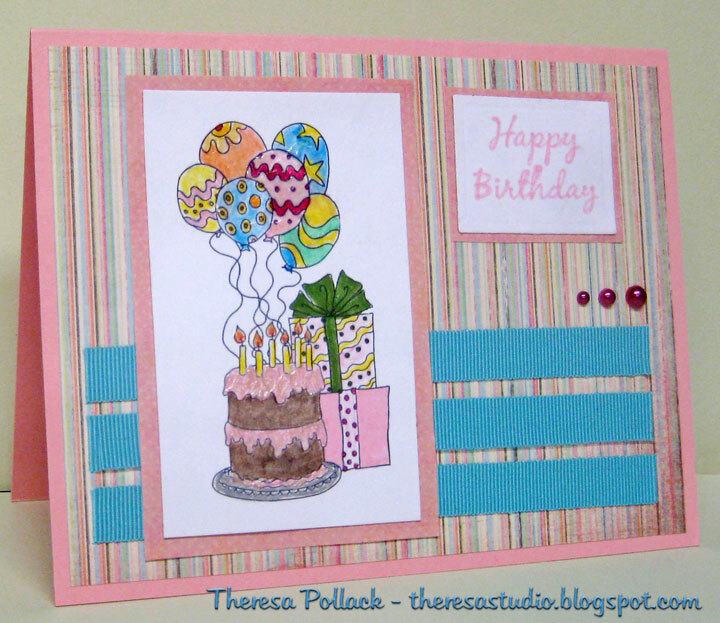 For this week's challenge at Isabella's Sketchbook , you are to create a Birthday card with an Isabella image.I chose to use Isabella's image "Birthday Party" that is so festive! I colored the digi with pencils, markers, and glitter gelli-pens. Also I used some stickles, glaze and crystal effects to add highlights to cake and balloons. I followed the sketch from Annabelle's Bling Sketch Challenge shown on right for my layout. Made card with pink CS base with stripe mat layered with grosgrain ribbon and image and sentiment matted on patterned paper. Finished with pearls for bling. Cake is chocolate with strawberry icing...yum yum! This card is for Jayme, a frog collector, who has terminal cancer. 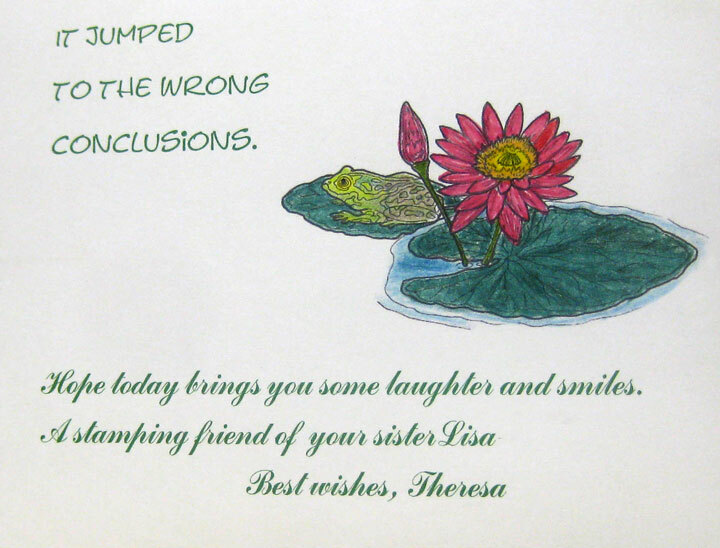 Her sister, Lisa, has requested on Stamp TV and her blog that all her card making friends send her a fun card...something pretty or funny that will make her smile. I found this digital from my stash of digis to make this for Jayme. More details on Lisa's Blog. 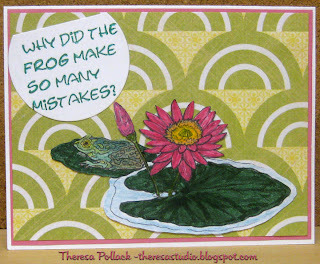 Printed digi of frog on a lilypad and colored with pencils and markers. Highlighted frog with some glaze. Used white base card with pink mat and mat of DCWV DP. Hope this makes Jayme smile. Sorry, I do not know the source of digi that I found on the net. Forgot to label source. And why did this frog make so many mistakes? He jumped to the wrong conclusions! Gina K's inspiration challenge this week was to make a project inspired by Ice Cream!! When I read this, I remembered the freebies on Stamp TV that had an ice cream cone in the Sweet Cupcake Card Template and Sweet Digital paper pack. I printed out the ice cream cone and one of the digital papers and came up with my project for the challenge. 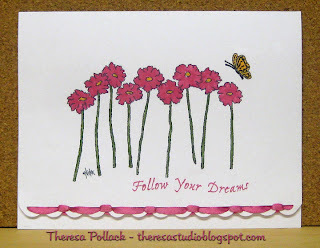 I used a sketch from Stamping 411 Saturday challenge. I colored the cone with pencils and used stickles and crystal effects to make look yummy. Popped the cone up with some foam dots on a mat that I gave texture to with Fiskars texture plate...kind of a waffle design. Stamps from Hero Arts and SU. Time to go raid the fridge for some ice cream! Have a good day! City Crafter Challenge this week had a very interesting challenge from Kristy: Use the picture below as inspiration, create a card/project, no color or Paris image is required. This picture reminded me of a trip to Paris in 1969 ( many years ago) so I pulled out a picture that I made of the Eiffel Tower as I walked the Champs Elysee and cropped out a portion to use on my card. 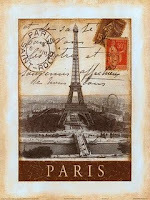 I also had some old paper from PSX with a travel theme and a section just happened to show the Eiffel Tower. Pulled out some beads and mother of pearl leaves that I saved from an antique hat (maybe Parisian)...I never throw anything away.....and voila I have a card. Used GKD PL Chocolate Brown for base card. 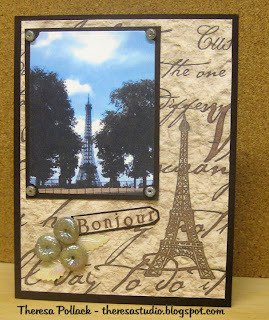 Stamped "Bonjour" with Hero Arts alphabet and Memento Rich Cocoa . Added glitter to the tower...can you see? Bonjour mes amis. Merci de votre visite. S'il vous plaît laissez un commentaire. Passez une bonne journée. 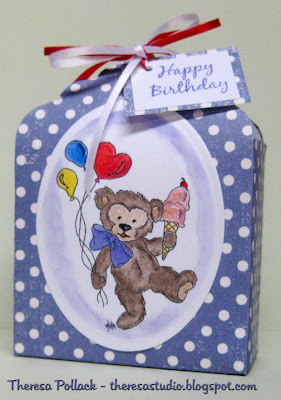 The challenge at Just Cute Bears Challenge is a Recipe- 3 Brads, 2 Papers and 1 Ribbon. I used a digital image from Phindy's Place called "Beary Beautiful" that I colored with pencils and OMS and some glitter pens. Made this for a get well card following the recipe. It was another rainy and cloudy day on Tuesday so what's to do but play in my studio. I made this card for Vicki's Sketch Challenge at StampTV. I had purchased this stamp a few weeks ago and had it on my work desk waiting to be inked so this was the day. I stamped it with brown ink on ivory cs and colored with pencils and OMS. Added some glitter to flower centers. 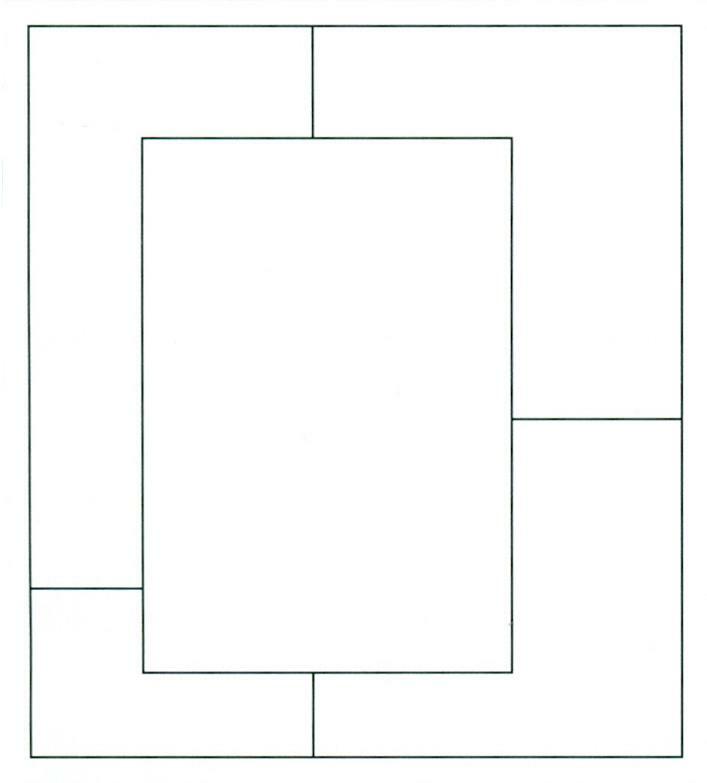 Cut image and mat with oval nesties. Stamped more butterflies, colored, and cut out for the sketch "Stars". 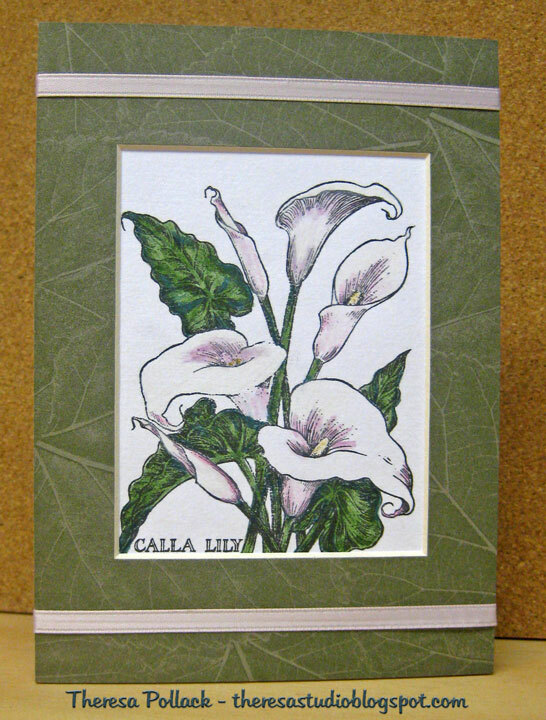 Embossed pink CS with CB EF Leafy Branch and wiped with green ink to highlight embossing. Added ribbon and attached butterflies with glue dots. Thought I'd included picture of stamps used so you can see where the butterflies came from. Hope you have some sunshine in your life today! At Stamp TV, Tina had a color challenge for red, white and blue. 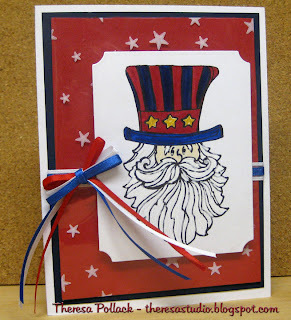 At Just Us Girls, Lisa had a color challenge also for red, white, and blue with kraft as an optional color. I pulled out this old stamp bought at a garage sale and used for the first time. 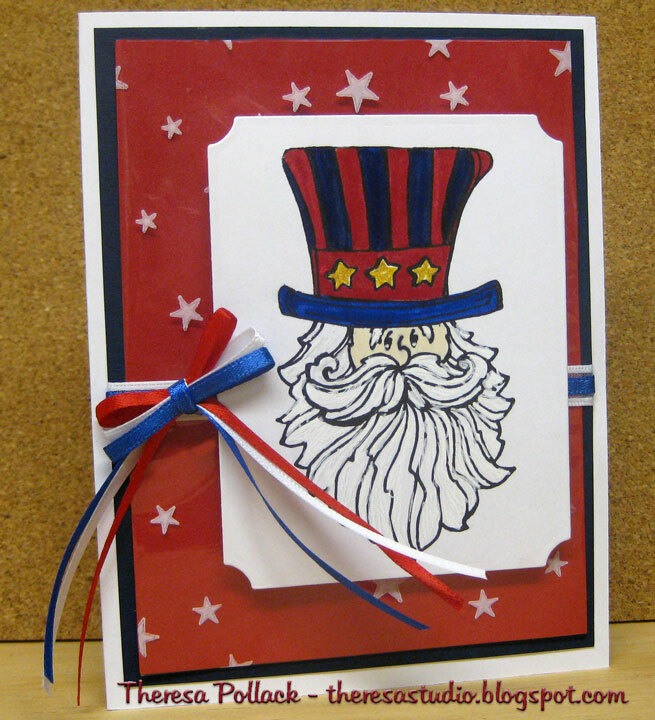 Thought Uncle Sam would make a great patriotic card. Stamped it on white CS and colored with markers, white pen, and gold glitter pen. Cut with nesties. For years, I have saved some clear cello printed with white stars that I used to cover the mat of red CS. Used white base card and a navy mat. 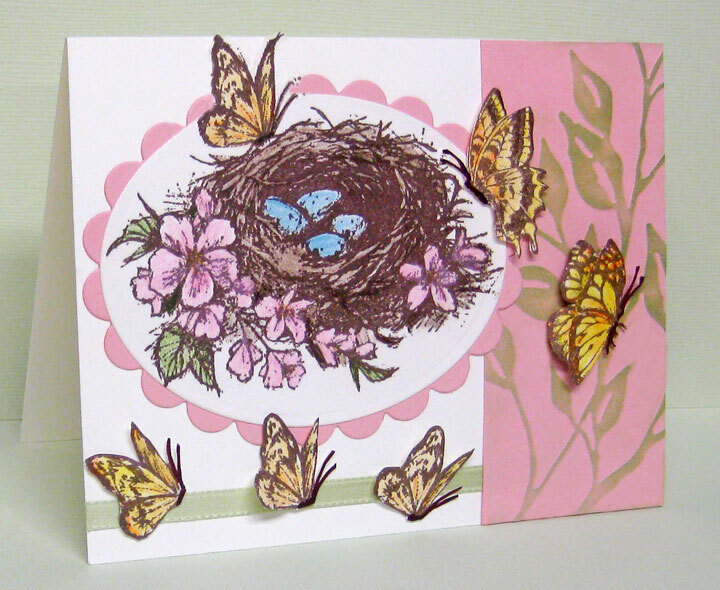 Assembled card following sketch challenge from Stamping 411. Added a trio of ribbons. Have you made plans for Memorial Day Weekend? 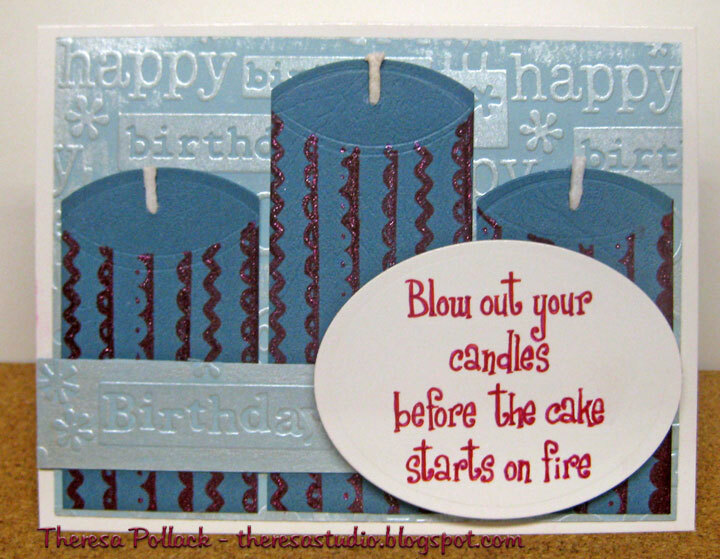 The Sketch challenge shown on right at A Fairy Creative Place for some reason brought candles to mind and I just received this new sentiment from CCS so I envisioned this birthday card. Used a base card of Oyster Pearl that has a sheen to it and then embossed a blue mat with CB EF Happy Birthday. I wiped this with Brilliance Platinum Planet ink pad to bring out the embossing. Cut my "candles" and then used a Nestie oval die to shape the tops, stamped on stripes with a MS border stamp in SU Ruby Red ink but then used a Glitter Jelli-pen to highlight the stripes. Punched holes in the top of "candles" and added wicks for a real candle look. Finished with a strip of embossed blue CS and the sentiment "Cake on Fire" from CCS stamped on an oval which I popped up with dots. The stripes on the candles were suggested by my DH who said they looked too plain as they were. He does come up with good ideas! I was just playing around with some leftovers and made this card. 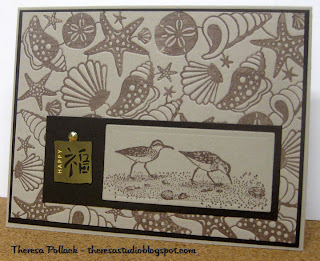 Had used Spellbinders Impressabilities Sea Scape that I inked up and made this background on soft sand paper. Matted it on brown CS and then a base card of sand. 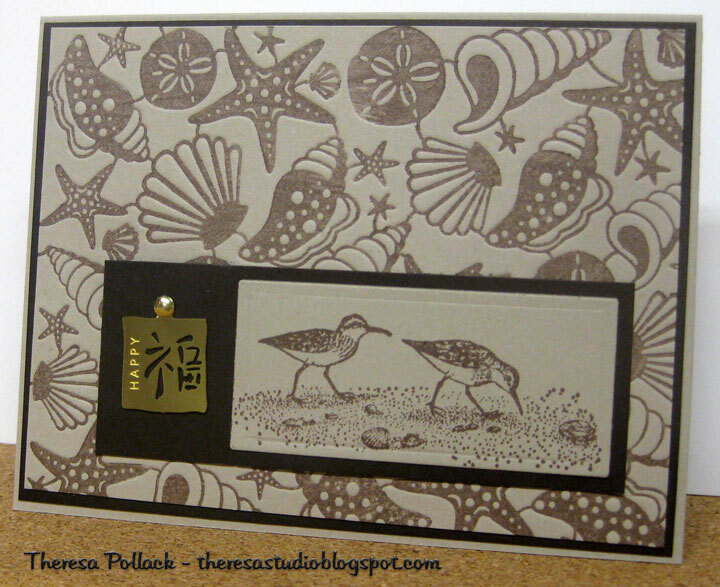 Added the stamped image of sandpipers matted on brown and added a charm with a brad saying "Happy" to wish a happy birthday. Paper Play Challenge: A relatively easy challenge, you must use brown and another color. I used soft sand. Our Creative Corner: The challenge this week is to make a masculine birthday card. 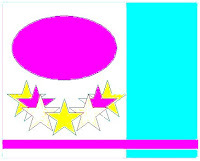 Guess I love this paper since I just made another card with it and am still playing with this digital image from TMITA. The challenge this week at There's Magic in the Air is from Nilla who wants us to take inspiration from this bouquet and create however you are moved to create! The pink and green in the photo reminded me of these papers and I had to use "Softly Afloat" again...but in pink and green. Added a flower and a charm so the card also qualifies for the challenge "Blooming Charming" at Cupcake Craft Challenges to use blooms and charms on your card. 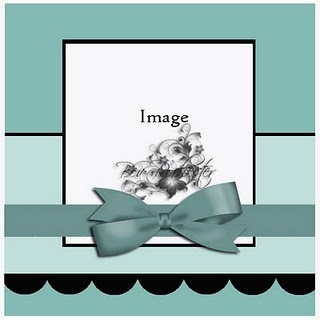 Image: Paper Cupcakes "Softly Afloat"
I bought some great designer papers from K & CO this weekend that I love and used 2 of them in this card. Gina K challenged us to create our very own butterfly garden using her photo as the inspiration. 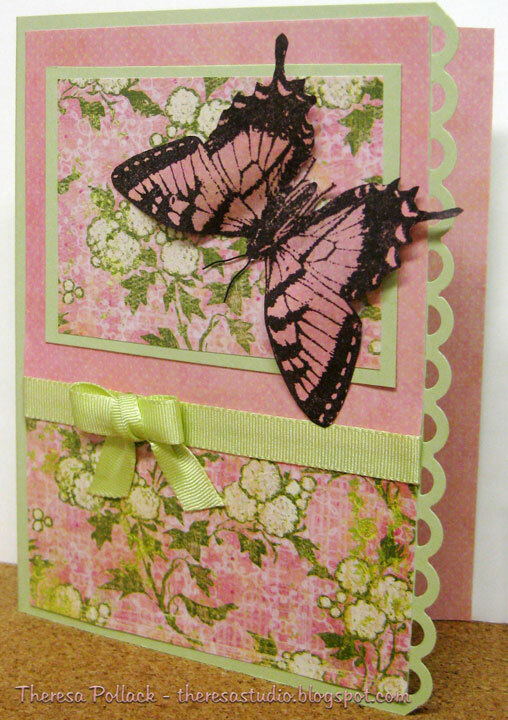 I was inspired by the greens and pinks in the photo as well as the butterflies. 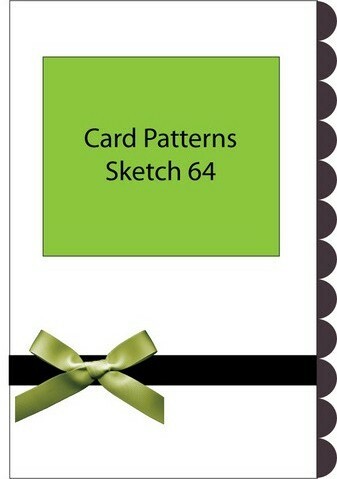 I also used the Card Pattern Sketch 64 that Gina K is sponsoring this week. See below on left. Stamps: GKD "Hope is Faith"
Hope this inspires you to make a card today. On the right I am showing the header from Isabella's Challenge blog. Their challenge this week is to create a project using an Isabella Sketchbook image and any combination of the colors in their header ...that is why I have included the banner to show you the lovely colors we are to use. In my card, I have used this lovely image of "Sweetheart Flowers". I thought it was perfect for the colors from the header. 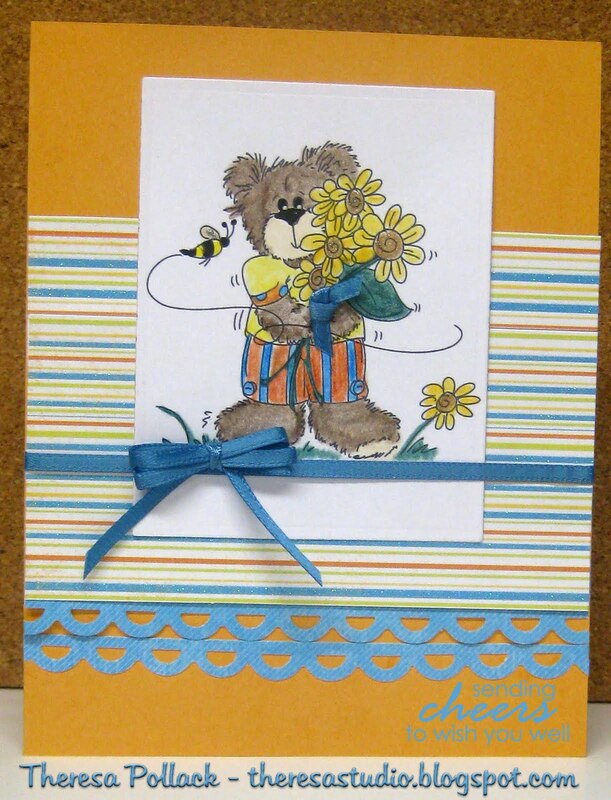 I used KIN pencils with OMS for the image that I cut with Spellbinders Labels 9. 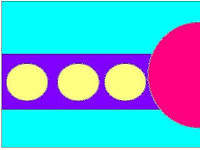 I layered mats in 4 colors from the header and added ribbons in 3 of the colors. Finished with a sentiment on a tag. Loved working with these beautiful colors. City Crafter has a color challenge for CCCB week # 4 to use pink and green. I needed to make a card for my niece's 6th anniversary. 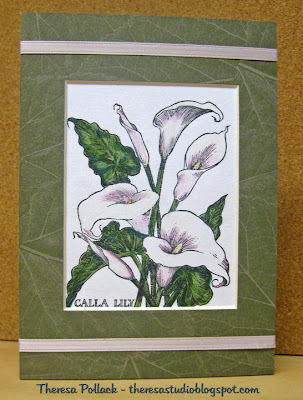 She carried calla lilies at her wedding and the flower for the 6th anniversary is also the calla lily. So I combined this challenge with her card and made this. Used a precut mat for a frame that I purchased at Joann's to show off the image that I colored with pencils and markers. 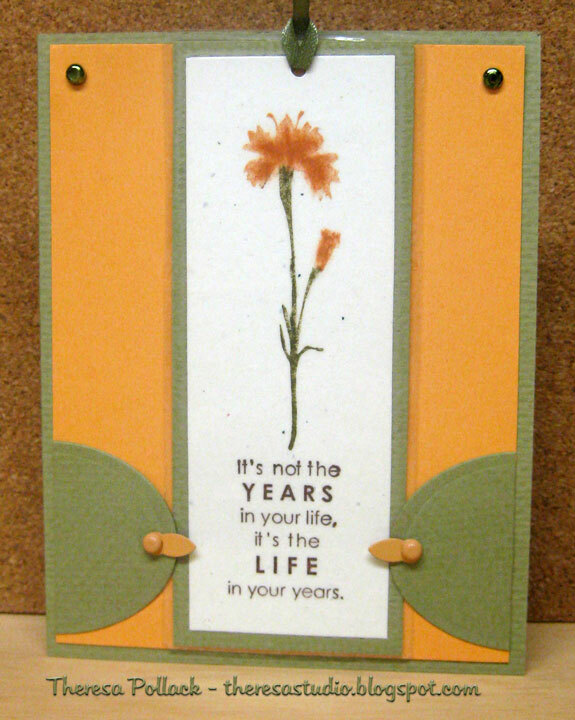 Mounted this on a base card of white and included sentiment on inside for a Happy Anniversary. Added some pink ribbons to finish the card. Stamp is an old one from PSX. Bought this mat for 50 cents sometime ago and finally found a good use for it. 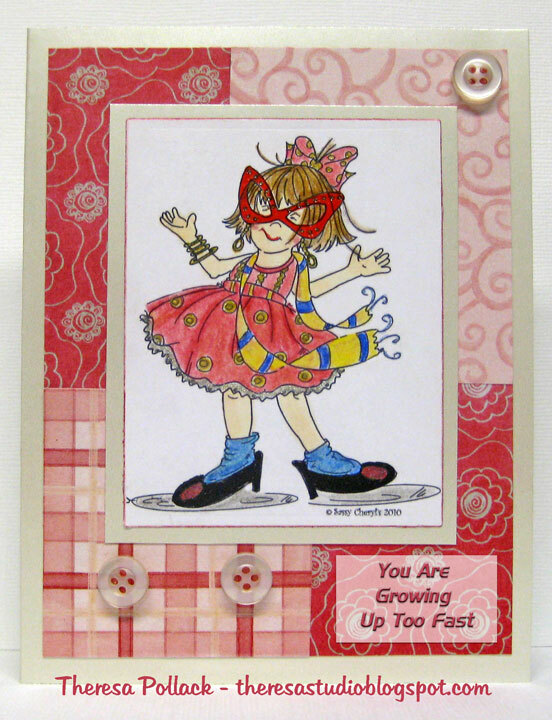 I made this card for the sketch challenge at A Fairy Creative Place. Sketch is shown below. I cut out designs from glittered patterned papers and matted as shown. 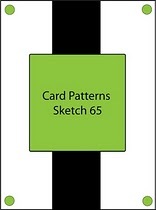 Use green patterned CS as base card. Punched out 2 butterflies of DP and stamped sentiment on to solid mat. 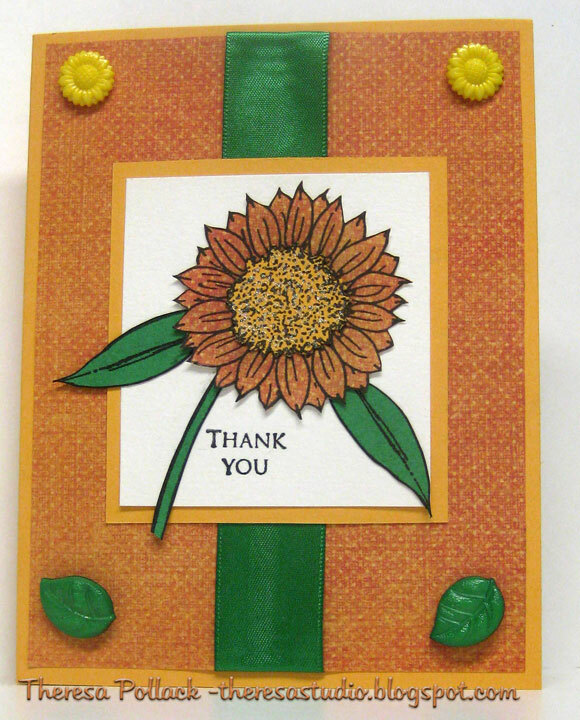 Click to enlarge to see glitter on card. Have a great day ...go look at the spring flowers. For the Sassy Cheryl's challenge this week, talented hostess Dawn put together a sketch for us to follow. Sketch is shown below. I chose to use the digi image of "All the Frills", a fun, fun image. Image: Digital-Sasy Cheryl-"All the Frills"
Have a great day....enjoy some frills! Another Stamp TV challenge! 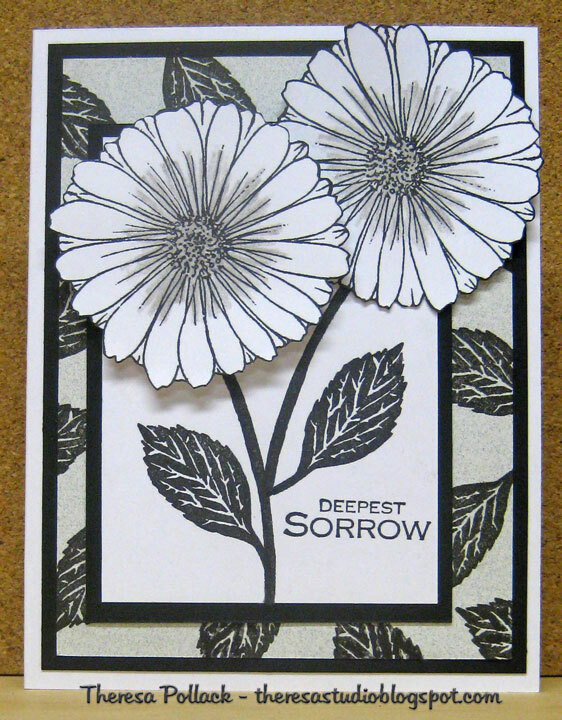 Made this card for Tina's color challenge of BLACK, GREY & WHITE!!! This card is similar to a card that I made for Melanie's Case Challenge which I ended up adding to this color challenge also. This is a good week for card making since it has been a rainy one. Trying to do some challenges now so I can work in the gardens when the rain passes and warmer weather is here. 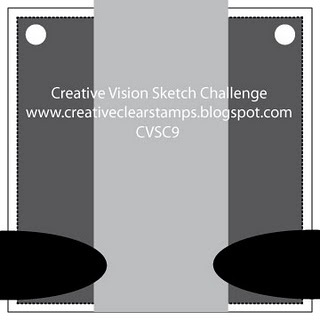 I stayed close to Vicki's sketch challenge (shown on lower right) this week using the spotlight technique that she showed on her sample card. By the way, I won last week's challenge and received my prize on Monday. Those ladies at Stamp TV are really quick! I chose "Nana"s Needlework" by Nina. Can't wait to get ink on that. Clean and Simple with Softly Afloat! 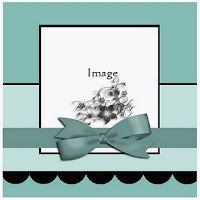 First, I have to say I just love this free digital image "Softly Afloat" that is available at There's Magic in the Air this week. Thanks so much Nina!!! This week, Sue brings us the challenge to do a CAS (Clean & Simple) card and use the "Softly Afloat" image from Paper Cupcakes. This was a joy to do using this digital image....so much that I made 2 cards. And I have so many other ideas especially after viewing all the great DT's cards. Going to be using this image a lot. My cards are very clean and simple....don't believe I could be any more simple! Hope you find some magic in you life today! First time to case a card and I have to choose someone as a great as Melanie. What was I thinking??? 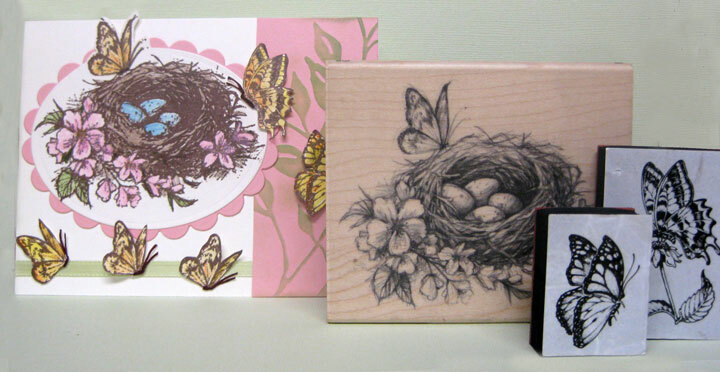 Melanie Muenchinger is a stamp designer/illustrator and Senior Design Team Member of StampTV. I just love her stamps and her creations. She has thrown out a challenge to create a card inspired by anything she has made on her blog Hands, Head and Heart or posted in her STV gallery, but change it up somehow giving it your own fresh spin! I chose to case this card which is in her gallery on StampTV and made with her stamp sets "A Year Of Flowers" and "Pressed Flowers". If you have not visited Melanie's blog or STV Gallery, please do. You are in for a treat. 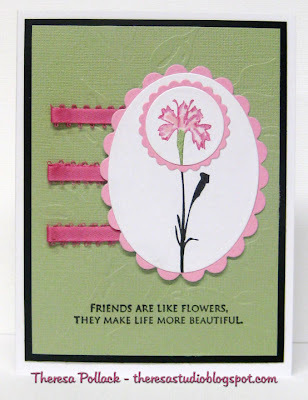 I chose to do my card with other flower and leaf stamps from these two sets and changed the colors to black, grey and white. I know I cannot equal the beauty of her work but it was interesting to case this card with my own twist. I did the background mat with grey CS and stamped that with leaves in black. I stamped flowers on white CS and added some grey to centers by coloring with pencil. I cut these out and used pop up dots on one for dimension. I stayed pretty much with the same layout as Melanie's card. Stamps: GKD- Sentiment from "Spring Florals"
Melanie's " A Year of Flowers" and "Pressed Flowers"
I am anxious to start gardening and planting but our weather is still too cold to plant. We have had frost the last 2 nights so I must be patient. I do hope my Iris that are starting to bloom are not hurt. But one can still think of flowers in another way as shown in Gina K's Stamp TV video here in which she makes a basket decorated with flowers. 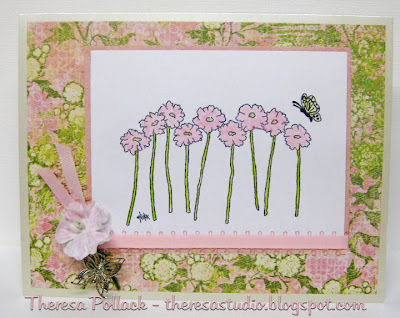 Her challenge this week is to grab some flower stamps and stamp up a garden! You can make a card, scrapbook page or a 3-D item. I made this basket following her directions which are so easy to do. You must try one....a great gift idea. I used patterned and glitter papers from a DCWV Spring Pack. 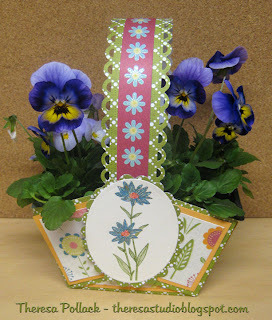 Instead of ribbon I cut a border from one of the paper designs and attached to the handle. 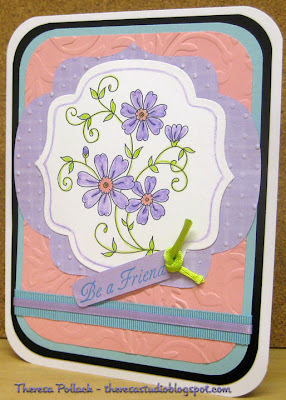 Using nesties, I cut ovals and stamped flowers from GKD Spring Floral stamp set for the sides and colored with markers and pens. Used Fiskars punch for scalloped edge on handle. Violas from our local greenhouse. Are you ready to grow things too? Our Creative Corner-challenge is to make an Anniversary card with the year in mind. The year in mind is 33 but no specific flower for this year so made with a bouquet . A Spoonful of Sugar-challenge is to use Furry friends (animals) on a card. Sassy Cheryl-Dawn provided a colorful picture as inspiration that we get to interpret in any manner we choose -- as long as we use a Sassy Cheryl image. I used the flowers and colors as my inspiration. Colored the image with pencils and OMS, markers, and glitter pen. Made my background paper by embossing and inking raised surface with a pod. 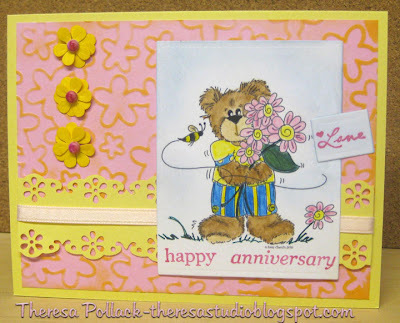 Stamps: GKD "Happy Anniversary", Hero Arts "Love"
Hope you have a happy day! Thanks for your comments. I used a base card of one DP and stamped the sentiment at the top. 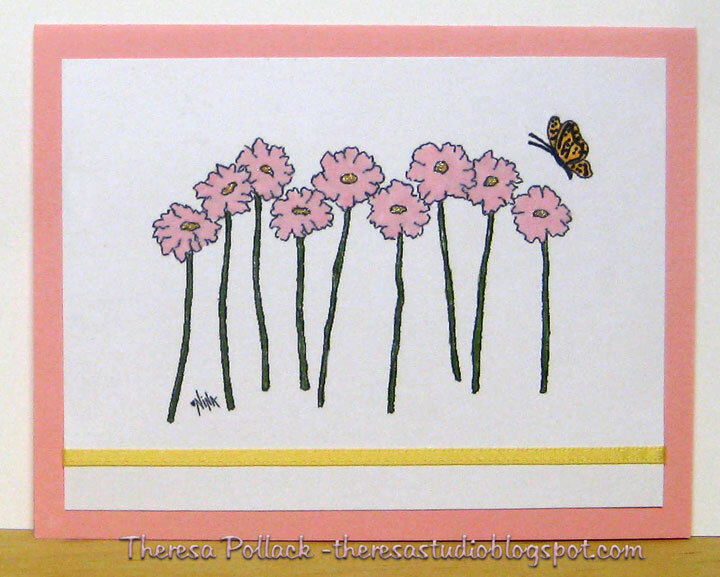 I stamped the flower image using markers to color. I attached the image, attached my ribbon and added the bottom strip of a second DP. Finished with some pearls for bling. A simple card but fun putting it all together.